Acknowledged author Donald E. Kieso wrote Intermediate Accounting, 16e Binder Ready Version + WileyPLUS Registration Card comprising 1468 pages back in 2015. Textbook and etextbook are published under ISBN 1119231558 and 9781119231554. 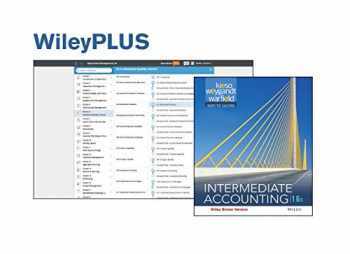 Since then Intermediate Accounting, 16e Binder Ready Version + WileyPLUS Registration Card textbook received total rating of 4 stars and was available to sell back to BooksRun online for the top buyback price of $69.98 or rent at the marketplace. A piece of plastic cover wrap is missing. Brand new book with access code.